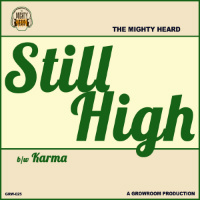 In the second herbally-themed post this weekend at MB, comes news of the next release on Growroom Productions – single Still High from The Mighty Heard. 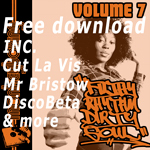 Originally the brainchild of Honest Lee and Terry T, this Hyattsville outfit rapidly enlisted other musicians to become a ‘space-funk…intergalactic soul band’ subsequently joined by rapper Abudullah ‘Dullah D’ Thompson. Despite recording a full LP, WORD, in 2010 and touring until 2012, the band never released the album and Thompson sadly passed away in 2017. It was the latter event which prompted the band to make renewed efforts to release the LP and it seems this single is the harbinger of the full-length release. And so the soulful tones of Dullah D finally emerge from a fit of coughing, lazily swirling wah-wah and the light brushing of snares. The very musical incarnation of the stoned awakening. So I’ve been given to understand. The equally laid-back flip Karma finds the band providing a similarly smooth groove while Dullah D ruminates on the notion of cosmic balance.